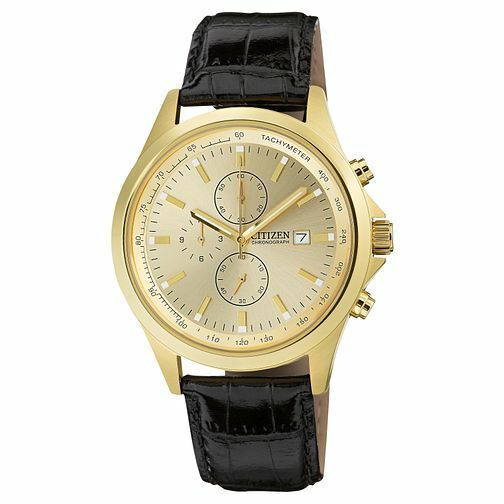 Citizen have proven their status as a quality watchmaker with this timeless men's leather strap watch. Classic in yellow gold plating, the case frames a champagne chronograph dial complete with tachymetre and date window for extra functionality. Finished with a traditional black leather croc effect strap, this watch offers sophisticated simplicity. Citizen Men's Black Leather Strap Watch is rated 3.0 out of 5 by 2. Rated 5 out of 5 by Anonymous from Beautiful watch and striking design The watch is immaculate, the gold/black design is very striking and elegant. Bought it as a present and was very well received. Rated 1 out of 5 by Anonymous from Shambles Managed to get this product after alot of hassle and the battery has already died within 15 days of purchase!! Absolute rubbish!! !